When you think of all the Yankees great players from the 1995-2010, some of the names that come to mind are Derek Jeter, Mariano Rivera, Bernie Williams, Andy Pettitte, etc. One name missing from that list would probably be Jorge Posada. He’s always been overshadowed, with the constant sluggers coming and going in the Big Apple (Giambi, Sheffield, Abreu). When you look at a team filled with superstars, sometimes people get left out of certain discussions, and it’s about time Posada is given credit for all that he’s done. Posada is a 5X All-Star, 5X Silver Slugger and a 4X World Series champion (5X if you count ’96..where he played only 8 games). I’m not going to analyze all of his numbers, and start comparing him to each and every player, because you already know that he’s one of the greatest offensive catchers of all-time. When Posada took over the starting catcher’s role in 1997, the fans didn’t know what they really had. Over the next thirteen years, Jorge became an offensive force in the American League. You can tell me that he can’t run, he calls a bad game behind the dish and he doesn’t have a very good arm. It almost sickens me to hear all the complaining about him. How often do you get a catcher who can both hit for power and play great defense? Not very often. Posada has one of those qualities, and he’s good at what he does. Finding a solid catcher in the major leagues isn’t a very easy thing to do. Georgie is a switch-hitting catcher with power, which is considered a rare commodity. Watching Molina, Cervelli and Moeller hit over the last few years has been painful. It gives you a greater appreciation for what Posada has done, and how long he has done it. I’m well aware that the Yankees have great catching depth in the minors, with Montero, Romine, Sanchez and Murphy coming up through the system, but prospects don’t always pan out. With Posada’s career winding down, you really shouldn’t take him for granted. He ranks right up there with Elston Howard and Yogi Berra in the record books, and will go down as one of the greatest to wear the pinstripes. Hopefully, one day he’ll be inducted into the Baseball Hall of Fame in Cooperstown. When Posada hangs up his cleats, fans will look over his career and really start to appreciate all the things he’s accomplished in his career. Going into the 2001 offseason, most people could see the writing on the wall. Tino Martinez, a Yankee fan favorite was on his way out and Jason Giambi, the type of player George Steinbrenner loved, was on his way in. While there was really nothing that could be done from Tino’s perspective to stop this deal, it wouldn’t be the last time the Yankee fans would cheer for him. It didn’t take more than a month after the World Series for the Yankees to land their number one target as Jason signed on December 13th for 7 years and $120 million. Coming into 2002, the expectations for Giambi were high as he had won the MVP in 2000 and was runner up in 2001. His first year as a Yankee, he did not disappoint. He hit .314 with 41 longballs and 122 RBI’s while piling up 109 free passes. Giambi also won the AL Homerun Derby, the first since Tino Martinez did in 1997. This year would be his best year as a Yankee as he would not hit over .300 again during his tenure in pinstripes and he hit over 40 homeruns one other time (2003). In 2003, his average dropped suddenly to .250. However, he still hit 41 homeruns with 107 RBI’s and drew 129 walks. This year would be the last year he would play in 150+ games as a Yankee due to various ailments. Due to a begnin tumor, Jason only played 80 games in 2004 for the Yankees as he missed half of July and September and all of August. During his brief time playing, he hit .208 and 12 homeruns. In late 2004, the San Francisco Chronicle leaked information regarding Giambi’s steroid use in connection to the BALCO scandal that was sweeping up the sports world. With Kevin Long already hard at work with some of the Yankees’ hitters, I decided to look as far back as 1996 until now to see how his contemporaries have fared in their jobs. Stop for a second, think that everything you have known about the Yankees success — dynasty if you will — never was. Think for a second about everything you know about the Core of Four and then realize 75% of it might have never been. I know, it may sound like heresy, especially since it obviously did not come true, but still, it’s interesting to look back and go ‘Wow, what could have been.’ The implications of this could have changed the landscape of baseball as we know it. Derek Jeter: Can you imagine if the Captain was never drafted as a Yankee? It almost happened. The Astros eventually drafted Phil Nevin with the first pick of the draft in 1992, however the week of the draft, they were considering drafting Jeter. Hal Newhouser, former Astros scout would drive 3 1/2 hours to go see Jeter play and he tried to sell the Astros on Jeter. The knock against Jeter — who had a scholarship to Michigan if he didn’t get drafted — was thought that he would request a $1 million dollar signing bonus while Phil Nevin agreed to a $700,000 signing bonus. Because of the Astros drafting Nevin over Jeter, Newhouser quit his job in baseball and never went back. The 1992 draft had a few decent players (See: Shannon Stewart, Phil Nevin, Jason Giambi and Jon Lieber) outside of Jeter, but it is unlikely that if any of them were drafted to the Yankees, they would have been able to build a team around them similar to the way the Yankees have around Jeter. Another thought, if Jeter was drafted by the Astros, if they had not traded him, he would have not theoretically hit the Free Agent market until after 1998 — by then the Yankees with Jeter had won two World Series and was on their way to a three peat. While Jeter growing up was a passionate Yankee fan, one has to wonder if he would have entered Free Agency in 1998 and gone straight for the Yankees. It’s hard to judge whether or not Jeter would stick with one team throughout a whole career, especially if that team was not the Yankees. I know Jeter will never admit if that situation existed if he would have went to the Bronx. Jorge Posada: In 1995 on the heels of Don Mattingly playing his last game for the Yankees, GM Bob Watson turned his attention to Seattle’s first basemen Tino Martinez. Negotiations stalled when Seattle proposed the deal to include 6 players. Seattle was looking to send Tino, Jeff Nelson and a minor leaguer for Sterling Hitchcock, Russ Davis and Jorge Posada. Luckily for the Yankees the deal eventually was Nelson, Tino and Jeff Mecir for Sterling Hitchcock and Russ Davis. Mariano Rivera: Later during the same offseason, the Cincinnati Reds were looking to offload David Wells. At one point, George Steinbrenner called Reds GM Jim Bowden and offered Mariano Rivera and Jorge Posada for Wells. Instead, Jim Bowden traded Wells to the Orioles for Curtis Goodwin and Trovin Valdez. In 1995, as a 25 year old starting pitcher, Mariano Rivera wasn’t as feared as he is today. He ended 1995 with a 5-3 record, 5.51 ERA, 51 K’s, 30 BB’s over 57.1 innings. It was not until 1996 did he blossom as John Wetteland’s setup man striking out 130 in 107.2 innings while walking 34. If Mariano gets traded to the Reds, one would think he would have continued starting and one could argue that he could no longer be in baseball at this point in time. Phew, what could have been, almost scary, wouldn’t you say? One could argue that if these three aren’t on the team, that they Yankees don’t even win one World Series or even ‘Return to Glory’ like they have the last 15 years. There are a lot of ‘What ifs’ that could come from not having these three players. I won’t get into them, but as a fan, just sit back and think to yourself about how different the last 15 years could have been if all these events transpired. 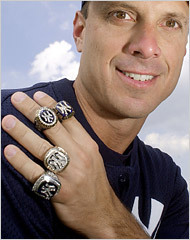 Tino Martinez says that the 2009 New York Yankees have the old swagger that the teams of the 90’s had. The Yankees stand one game away from advancing to the ALCS, and it’s definitely a good feeling considering the team hasn’t been there since 2004. “I still believe this team has more talent on paper than we had when we won those championships,” said Martinez, who first made that concession in spring. “Those teams probably would’ve folded in the ninth,” Martinez said. “They would’ve packed it in. And it’s been demoralizing to a former player to see other teams celebrating at our expense the last few years, especially when you know how Jeter and Mariano [Rivera] are feeling. Yankees Postseason tickets go on sale this Monday. They announced that tickets for the first two rounds of postseason games at Yankee Stadium will go on sale to the public on Monday, Oct. 5 at 10 a.m. ET. The New York Yankees are increasing seating capacity for playoff games at Yankee Staidum. They are going to install 60 cafe seats on the field level and sell 200 standing room places on the field and main levels during the post-season. The cafe seats will cost US$81 for the division series and $131 for the league championship series. Standing places will go for $30 and $25 in the first round and $64 and $48 in the second round. The Gate 2 movement is coming to an end. As of now, Gate 2 is not a part of the Heritage Field plans. Let’s hope that changes. Chuck Knoblauch was charged with assault, accused of hitting and choking common-law wife. He appeared in court on Tuesday to face assault charges brought by his common-law wife. Knoblauch’s wife told police he hit her in the face and choked her on Friday at their Houston home. The judge set Knoblauch’s bond at $10,000. It’s sad to see all the bad news surrounding Knoblauch over the past few years.